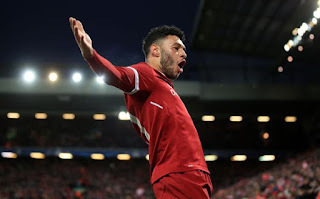 Liverpool midfielder Alex Oxlade-Chamberlain is one step closer to his Champions League dream but he believes beating Manchester City over two legs has longer-term implications. Jurgen Klopp's side won 5-1 on aggregate after a 2-1 victory at the Etihad Stadium to bring up two wins in a week over the Premier League champions-elect and make it three in the season against Pep Guardiola's team. They could now get defending European champions Real Madrid, Bayern Munich or Roma in Friday's semifinal draw but Oxlade-Chamberlain insists they fear no one. "This is a massive confidence booster for us. To beat City twice is no easy feat,'' he said. "We did it twice in a week and we also did it at an earlier stage this season. "It just shows to us that when we are at the right level we can beat anyone in this league. "Now it is on us -- whoever we get in the next round -- to go and prove we can beat people in Europe as well. "People might say Roma [is the preference] but look what they did, they performed amazingly well. "It doesn't matter who we get, we have to make sure we are ready for anyone and we can beat anyone.'' On a personal level, the England international is excited by the tantalising prospect of a major European final being within touching distance. "It is everything you dream of when you are a young lad,'' he added. "You want to play in finals and they don't come much bigger than the Champions League final so we've made my dream that one step closer by getting into the semifinals. "That is what we want to do as professional athletes: get to as many finals and then when you get there you want to win.'' Oxlade-Chamberlain paid tribute to Klopp for the way he handled the team trailing 1-0 having been under pressure for 45 minutes. He was grateful to see his boss in the technical area while City were left rudderless by Pep Guardiola's banishment to the stands at the interval. "He [Klopp] is a great manager and he has proved that over the years,'' he said. "Just as much as tactically he had a good plan, he also has the fire in him to get you all motivated and that is what he did at half-time. "He calmed us all down and then gave us a little bit of a rocket and just said 'no matter what we do now -- if we go through, if we go out -- we are going to do it our way,' and I think we did that much better in the second half. "Obviously you always want your manager on the touchline. He is the man you look to at times when we need information [even if] it is hard to shut him off as he shouts loud.